Once you've mastered making a simple straight sewing pillowcase, you may want to experiment with ways to make your pillowcase a little fancy. 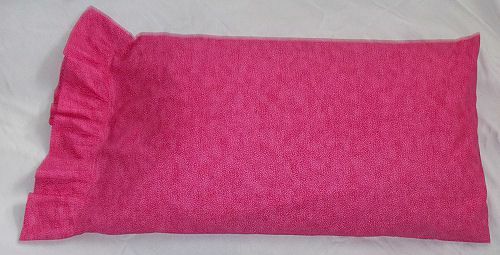 This ruffle end pillowcase is great for the girls and a great way to make things cozy. Sewing a pillowcase with a ruffle is also a great way to mix and match fabrics to compliment each other while using up your scrap pile. Always preshrink your fabric before starting the project. Standard Size (20" X 26") Pillowcase - 40" by 32"
Queen Size (20" x 30") Pillowcase - 40" by 36"
King Size (20" x 36") Pillowcase - 40" by 42"
Standard Pillowcase: (1) 8" by 54" or (2) 8" by 27 1/2"
Queen Size Pillowcase: 8" by 66" or (2) 8" by 33 1/2"
King Size Pillowcase: 8" by 75 or (2) 8" by 38"
Fold the 40" edge in half, aligning all of the edges. Pin one 20" edge and the long edge. Sew the pinned edges using a 1/4" seam allowance. Apply a seam finish to prevent fraying. Press the seams as they were sewn. Press the seams to one side of the pillowcase by working the iron inside the pillowcase without turning the pillowcase the right way out. Place the 8" edges with the right sides of the fabric together. Seam the 8" edge using a 1/4" seam allowance. Fold the length of the strip in half, matching the seams. Press the fold in place. Using a basting stitch, sew two rows of stitching along the edge keeping the stitching inside a 1/2" seam allowance. Fold the length of the ruffle by folding on the seam(s) first. Then fold the ruffle in quarters and mark the folds at the seam allowance edge of the fabric. Turn the pillowcase right side out and press. Fold the width of the pillowcase in half and mark the folds at the end of the pillowcase. Place the ruffle on the outside of the pillowcase. Match the ruffle seam to the pillowcase seam and align the raw edges. Match the second seam or halfway mark with the pressed side edge of the pillowcase. Match the quarter marks of the ruffle and pillowcase, aligning the raw edges. Gather the basting stitches to make the ruffle fit the end of the pillowcase, distributing the gathering evenly along the edge of the pillowcase. Stitch the ruffle to the pillowcase using a 1/2" seam allowance. Press the seam to the inside toward the body of the pillowcase. Top stitch the seam allowance in place by sewing an even distance from the seam on the edge of the body of the pillowcase. Use your presser foot as a seam guide to sew straight topstitching.